Im currently working on a big time consuming piece that’s quite challenging. 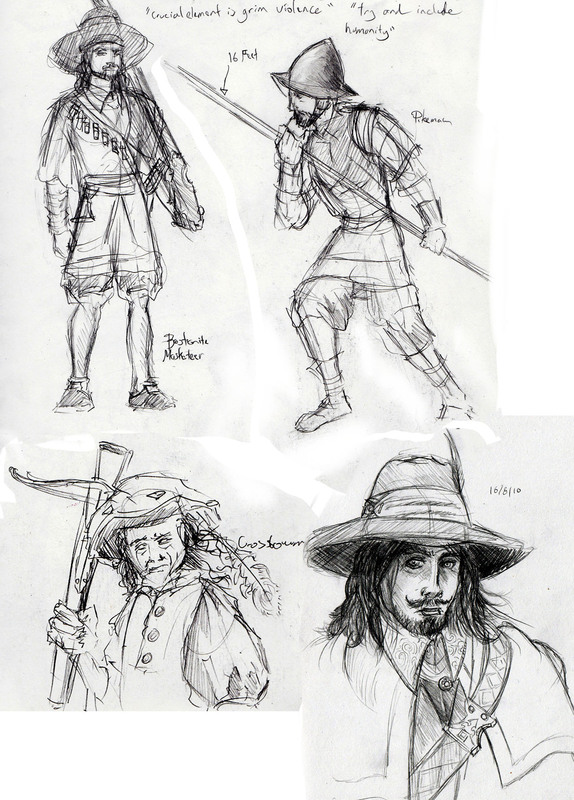 I’ve got to paint a big battle scene with lots of (English) civil war style soldiers fighting a giant creature. So basically that means painting a lot of pikemen. It’s the first time I’ve ever done so many people in one painting in this much detail and it’s pretty intimidating. Still, a little bit at a time and it should be finished eventually. I’ve been very inspired by the incredible big battle paintings of Mariusz Kozik, check his work out, he’s amazing. These sketches are for this picture I’m working on, since I wanted to have a clear idea of the characters and uniforms I was going to paint. The bloke in the bottom left is the brave captain, who’ll form a big part of the image on the right side, while rallying his troops and appearing to beckon the viewer closer. So far I’m about halfway through the image, which means in a couple of weeks it should be done. I’m finally back from my holiday to exotic Turkey, and now I’m 2% less pale. Nearer to cream than white at the moment, that’s a tan by my standards. I spent most of the time reading books eating food and lounging about the pool, but I did manage to get some drawing done too; while lounging about the pool mainly. 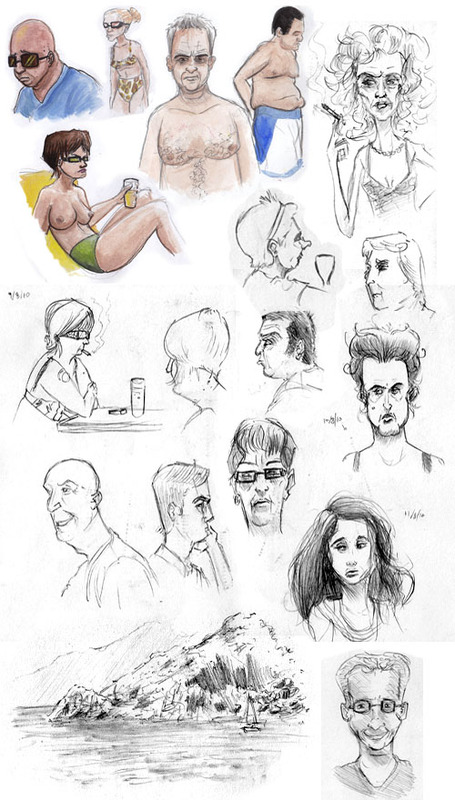 The faces below all belong to tourists and holiday makers I saw about and found interesting or amusing enough to draw. If you just got back from your holiday to southern Turkey you may just see your face/moobs on here. sorry 😀 I should point out that most of the people on here have been made slightly more grotesque than they are in real life. The sketch at the very bottom left is the Turkish coastline as seen from a boat.